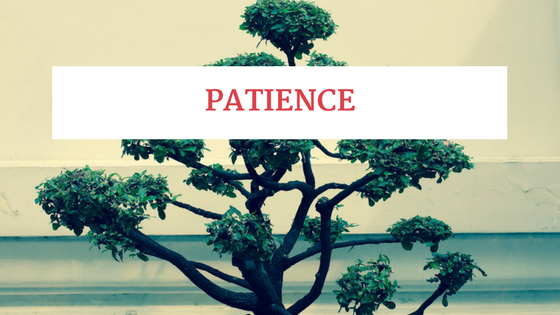 Patience is just like any other skill that requires time and practice to get it right. 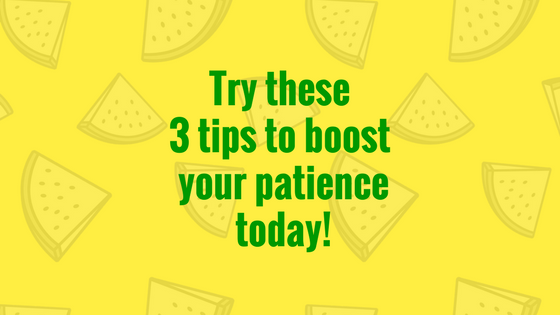 If you start to feel your patience wearing thin, try these 3 tips to boost your patience today! Whoa right? Sounds amazing to be able to accept trouble and suffering without getting upset, easier said than done? Well, not exactly…. you can get this done and increase your patience with some quick and easy tips. First thing is to identify which situations you struggle with when it comes to being patient. Is it when you have to wait too long for something you shouldn't have to wait for? Maybe it is when you tell your kids to go clean their rooms 37 times and they still haven't moved. Notice how it feels in your body when you start to get impatient. Where do you feel it? Maybe your chest starts to get tight, or your stomach gets a knot. Pay close attention to what tests your patience and how you know it’s happening. To take it one step further, try and determine why that situation makes you feel impatient. Being able to identify the triggers helps you to be proactive when it comes to your patience rather than reactive. Second. Okay you have already identified your triggers, what they feel like, where you feel them and why it’s happening, and it happens, your chest is getting tight and you are feeling all of those impatient feelings rising up. Now. You. Just. Breathe. 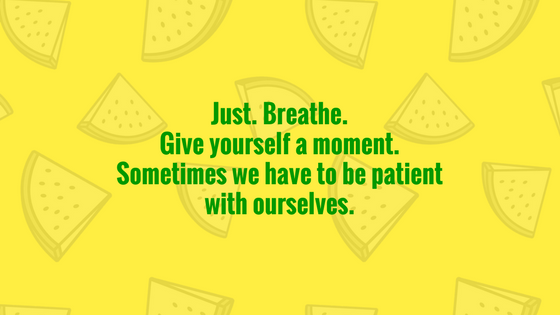 Give yourself a moment, (sometimes we have to be patient with ourselves). Some people count to ten, some people close their eyes, but all you need to do is take a few, 3 at the least, big full deep breaths. In your nose and out of your mouth. It is amazing how our bodies react to giving it oxygen. When we start to get worked up and feel ourselves getting triggered, breathing is the best thing we can do to start to help us relax. Third. You know your triggers, it is happening, you take some deep breaths, and then what? This is when you use what I call, control check. Determine your role in the situation and what you can control. So often we get ourselves worked up over things that we cannot control the outcome of, and if there is nothing that we can do about it, why let ourselves feel the stress over it. On the other hand, if there is something you can do in the moment or to prevent yourself from being triggered before you become impatient, then you can take control of the situation. Let’s take the airport for example. I get impatient when I have to wait at the airport. I know that waiting at the airport is a trigger for me. When I start to get impatient, I feel myself becoming anxious, which I feel the tightness in my chest. I remind myself to breathe, because the act of breathing helps my anxiety to decrease. Next I consider the control. Do I control how long the line is to get through security? No. Can I control the rude comment the guy behind me makes about the lady in front of me? No. Can I control the weather delay that is keeping me in Minneapolis when I’m trying to get to Denver in the middle of winter….? A that’s a big NO. So now what, I’ve felt felt the trigger, I have relaxed my physical self, now how can I keep my cool and remain patient? This is where some preventative measures come into play. Water- now I am aware that you cannot bring liquids bigger than 3 oz in your carry-on, but once I am through security, I’ll grab a bottle of water. Drinking water is another way to calm the physical reactions that come along with being impatient. Entertainment- so the music or podcast is great for walking through the airport, and when you are sitting and waiting at the gate and that could be enough for some people in the entertainment department, but for me, I know that I will have the headphones in, but my eyes will still wander and I’ll watch the clock or watch the people running with their luggage to their gates. So I will bring a book or a magazine to read and keep myself occupied until, finally, it’s time to go. This is how I personally use the 3 tips in order to keep calm when I know I become impatient at the airport. This is just one examples of many situations that could cause me to become impatient and how I handle it. 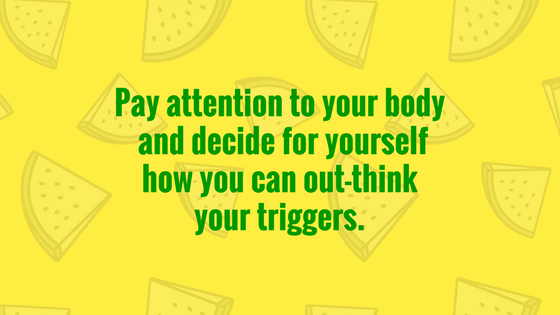 When thinking about your triggers, pay attention to your body and decide for yourself how you can out-think the triggers. What are your triggers? Take some time to self-reflect and get to know you! Let me know what tests your patience on Self-Reflection Sunday found every Sunday on Instagram. Click here to get access to the resource library and find more self-reflection prompts there. Or Click here to get the 30 Day Self-Reflection Journal on Etsy!